Enjoy your favorite 33 1/3 and 45 rpm vinyl records almost instantly with this B&H Kit that includes the silver Audio-Technica AT-LP60USB Fully Automatic Belt-Drive Turntable and the Mackie CR3 3" Woofer Creative Reference Multimedia Monitors. The turntable will start the platter once the tonearm is lifted and stop the platter when the tonearm is returned to its mount. This turntable has both a phono output and line-level outputs, the latter of which would connect to the included Mackie powered speakers. The CR3 speakers are powered, so you can simply plug them in and connect them to the turntable or whatever other source you want with their 1/4", 1/8", or RCA jacks, all of which are dual mono inputs. They feature a bass-reflex design with rear-facing bass ports to enhance the low-frequency effects of the 3" polypropylene-coated woofer, while highs are produced with the 0.75" silk dome tweeter. Conveniently, all the inputs are located on one speaker, which can be designated as either left or right via a rear-mounted switch, and that speaker has a stereo spring-clip output to the other speaker. The silver Audio-Technica AT-LP60USB Belt-Drive Turntable is straightforward and completely automatic for vinyl enthusiasts in need of a turntable to complement their existing home-theater and stereo systems. Its fully automatic operation starts the platter when the tone arm is lifted, and brakes when the needle is positioned on its mount. The turntable features phono (turntable level) outputs, however a built-in preamplifier features line-level outputs for connecting to amplifiers without turntable inputs. The ATLP60USB features 33-1/3 and 45 rpm speeds. The Mackie CR3 3" Woofer Creative Reference Multimedia Monitors (Pair) is a compact and portable solution for providing audio playback in home and studio environments. They're designed for multimedia work such as mixing music or post-production sound design. The pair consists of one passive unpowered speaker and one Class-AB amplifier powered speaker that connects with an included 6' stereo cable. The monitors use 3" polypropylene-coated woofers, a rear port tube for the low end, and 0.75" silk dome tweeters for the highs to deliver a frequency response of 80 Hz to 20 kHz with a maximum SPL of 97 dB. A switch allows you to select whether the powered speaker will function as the left or right speaker. This is helpful when having to position the speakers near power outlets or when deciding which side is preferable for the volume knob. A front-panel, LED power-ring illuminated on/off switch and volume knob allows you to control level. A dedicated front-panel headphone jack defeats the main speaker output and can be used to expand the system's monitoring versatility. A front panel 3.5mm stereo input and included 3.5mm to 3.5mm cable allows you to connect your smartphone or other mobile device directly to the monitors. Other equipment such as audio interfaces, CD players, or mixers, can be connected to the rear panel's 1/4" TRS, 3.5mm TRS, or RCA inputs. The monitors come with a 3.5mm stereo-to-RCA cable for connecting to a computer. Also included are isolation pads for reducing the transmission of structural vibrations and for allowing the monitors to be tilted slightly up or down for a better listening angle. 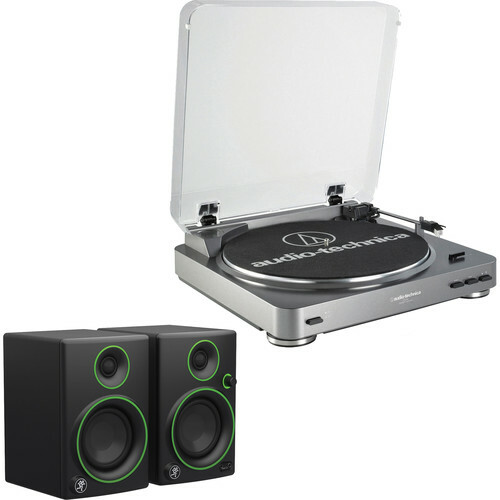 Box Dimensions (LxWxH) 17.6 x 15.9 x 5.8"
Box Dimensions (LxWxH) 16.0 x 11.0 x 8.0"
AT-LP60USB Fully Automatic Belt-Drive Turntable (Silver) and Powered Speakers Kit is rated 5.0 out of 5 by 5. Rated 5 out of 5 by Marina S. from Great starter kit The setup was very quick and easy. The speakers are small but they have such a good quality sound! I'm just getting into vinyls and I did alot of research on turntable and audio Technica is a great starter and the price is really affordable! I would definitely recommend this to someone who is just getting into vinyls. Rated 5 out of 5 by snogoldi from Nice Product Sold all my stereo equipment including my Audio Technica turntable. Now have sound projectors. They do not have Phono connections. Wife wanted to convert a few old vinyl records to digital. This unit fits the bill, it comes with great little sounding powered speakers and the turntable has a built-in preamp so it will connect to the sound projectors. The system sounds great all by itself and the usb recording portion works well. Rated 5 out of 5 by Frederick from Great sound I have a small man cave, and this turntable and speakers are just enough punch, strong sound. BH as usual has what I want, and very fast delivery. I have been a customer for years. I will remain a loyal customer. Rated 5 out of 5 by Anonymous from I would recommend this product Clean little setup. Not amp to mess with. Easy to move around the house for parties. Great sounding speakers. Super value set. Rated 5 out of 5 by Robert from Happy Excellent powered speakers, typically fine Audio-Technica turntable, and quick, easy setup make this a must have and a great price. All u need is this turntable, these speakers and youre good to go. Is there an elliptical MC or MM replacement for the supplied cartridge ATN3600L? Compatibility with preamp? Can the cartridge be replaced? Asked by: E. R. M.
We do not offer an elliptical stylus compatible with this cartridge. Is there a MC or MM elliptical needle compatible with the supplied ATN3600L. Compatible with the preamp? The included cartridge and elliptical stylus are moving magnet types and are compatible with e built-in preamp. Does anyone know if the cartridge/stylus is replaceable with a better Orfton or something later on? Cartridge is not replaceable. Only the stylus is. will this bundle be shipped together inside one box or multiple? It was delivered in two boxes on two different days by UPS. Does the system need an amp? If youre purchasing the kit with the speakers included, no. Is the needle replacable and does B&amp;H carry the part? Yes! The needle is replaceable. I actually dropped my entire turntable when I was setting it up. The only thing damaged was the needle. It was easy to replace, and quite inexpensive! Unfortunately B&amp;H did not carry the replacement needle but there are numerous sellers that do carry it. Hi, this turntable version does not have bluetooth.